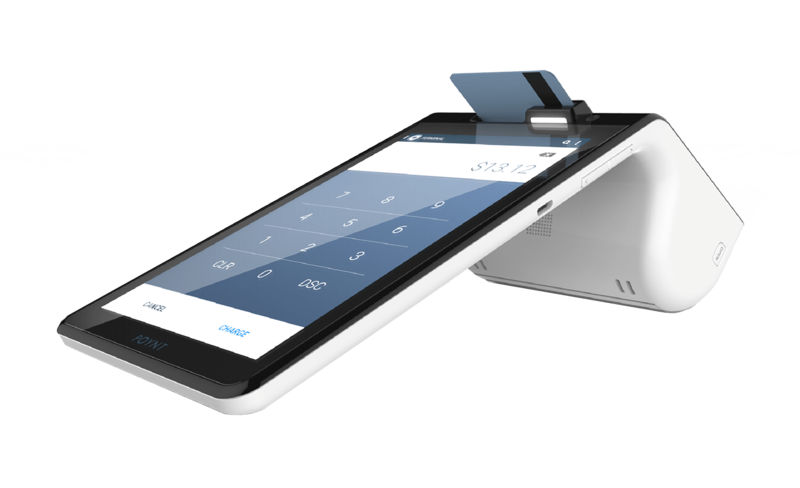 The first payment terminal you’ll love, and the last one you’ll need. Starting at $20/month and $599/device. Smart isn’t just for phones anymore. Your business deserves modern technology. The Poynt Smart Terminal is an all-in-one smart device you’ll be proud to display on your countertop. Fully handheld with an all-day battery life, Poynt goes where you go. 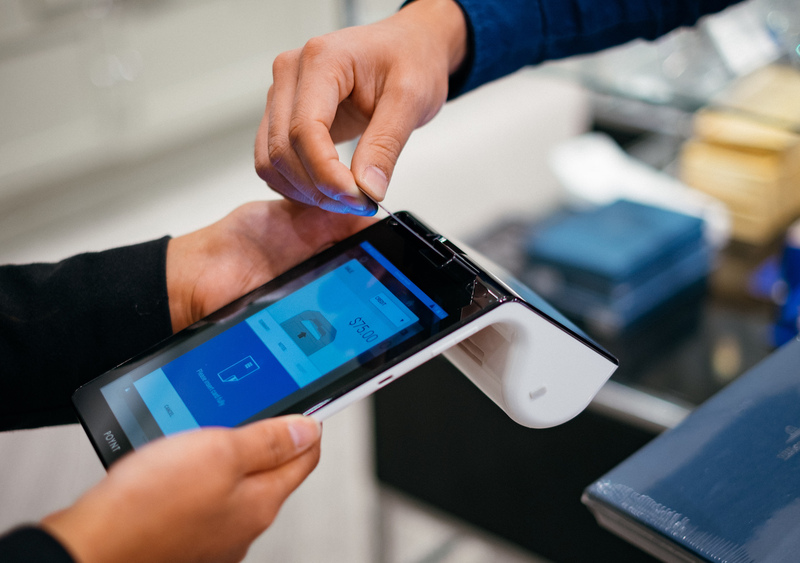 Easily accept every type of payment possible – with no extra steps or hoops to jump through. Manage your entire business from the free smartphone app, to ensure you stay on top of everything. Poynt blends technology and simplicity so you can keep your focus on running your business. 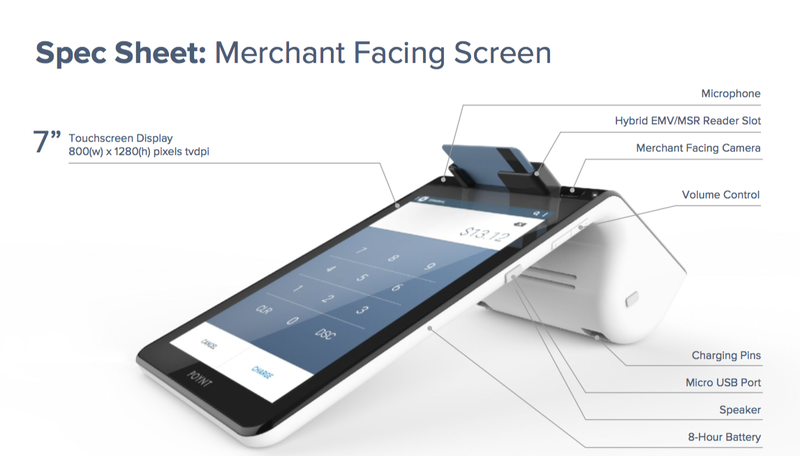 Poynt gives merchants a large 7″ touchscreen to easily manage payments, your product catalog, an app store, and more. The multi-touch display is quick and responsive, and is based on the Android operating system. 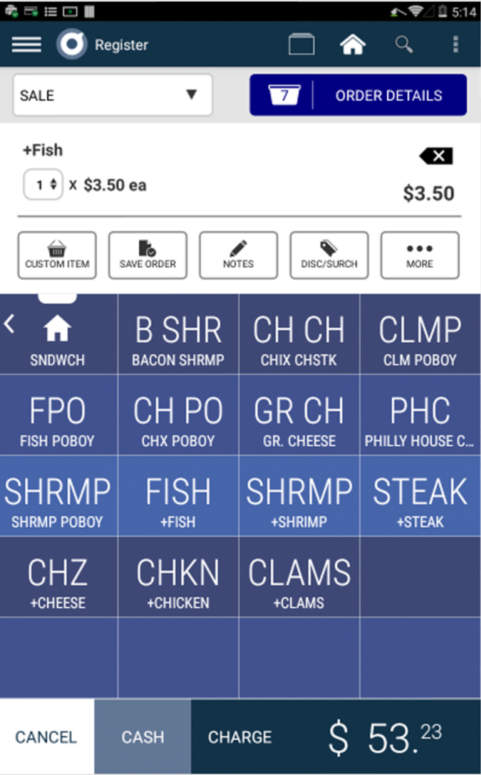 Menus are easy to navigate, options are straight-forward, and completing a transaction takes just a few seconds. In addition, there’s a separate 4.3″customer-facing touchscreen for your customers. As you ring up orders, customers will see line-item details, taxes, and discounts in real-time. They’ll also be prompted to select their payment method and receipt preference after a sale is over. 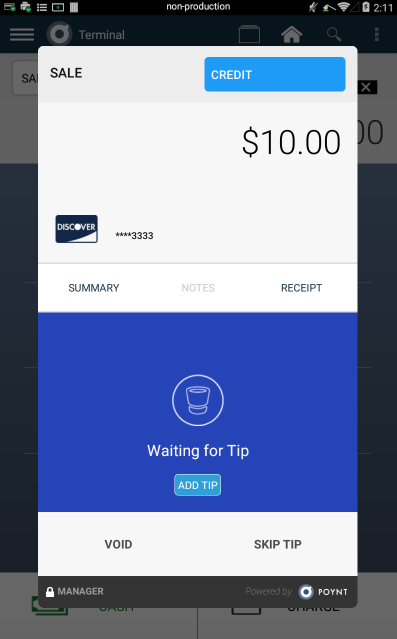 Customers can also digitally sign, enter their PIN for debit sales, and if you’re a tip-accepting merchant, customers can even enter their tip on the customer-facing screen. Nice! The Poynt terminal comes with a built-in charging dock, so that you can keep the device “docked” on your countertop, or you can easily pick it up and walk around! The entire device is hands-free, and operates independently of the base. A built-in WiFi connection ensures that you have the ability to process anywhere you have a WiFi signal. Or, you can opt to purchase the 3G version, and utilize your own mobile carrier. You can utilize any wireless provider you’d like, so you’re not locked into a specific provider! Poynt has an all-day battery life, and allows you to “line-bust” by taking orders on the go. When you’re ready to go back to “countertop” mode, simply place the Poynt terminal onto the base. The magnetic connection ensures the device stays securely connected to the base until you’re ready to go mobile again. Poynt can also handle receipts however you’d like. Your customers will be prompted on a per-transaction basis if they’d like either a printed receipt, emailed receipt, text receipt, or no receipt. All Poynt Smart Terminals come with free access to a smartphone app for real-time tracking of your daily sales. Data will sync up with your cloud login, too – create different users, manage your product catalog, view sales history and more in the Poynt HQ Dashboard. You can even remotely settle your day’s transactions, so you’re always in control. With Poynt, you can also order paper directly from your device. Poynt saves your payment information and delivery details so you can get replacement paper shipped out in a jiffy. Poynt also allows you to interact with your customers by requesting quick positive/negative feedback reviews, and then allowing easy email/text messaging back and forth. Now you can learn more from your customers in an easy and secure way. 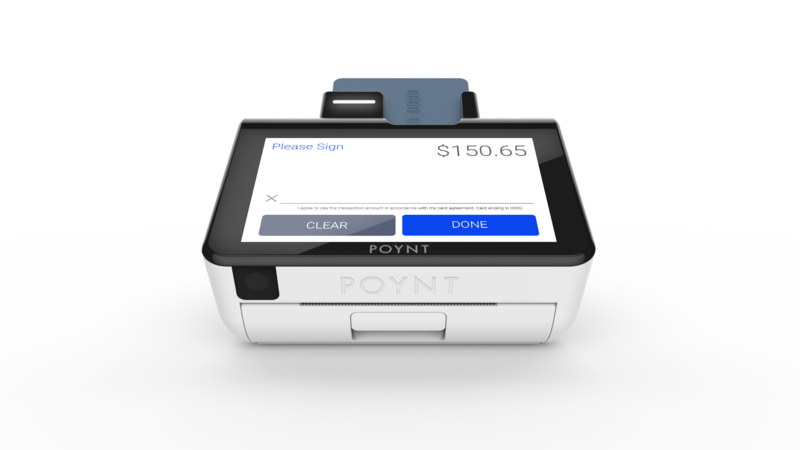 Customers will love paying with Poynt. You can easily interact with your customers, while keeping your private data on the merchant-facing screen. 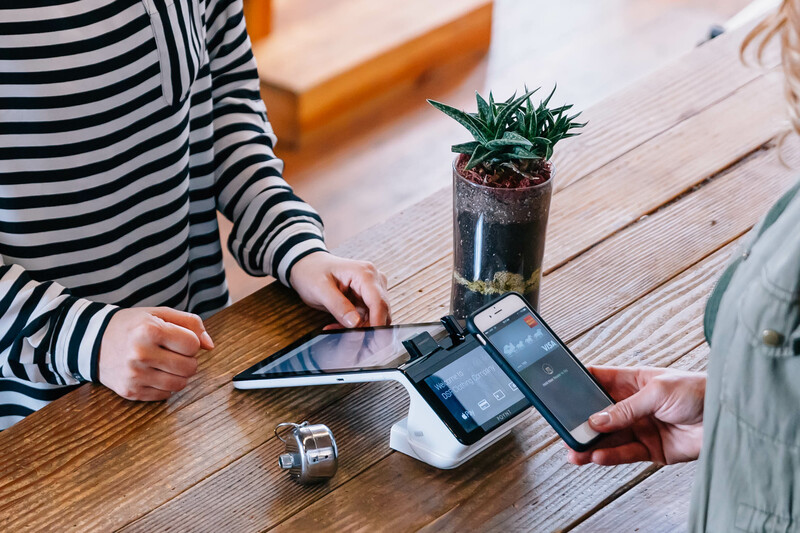 Ask for tips, offer receipt options, allow customers to sign digitally, input PIN numbers, and accept contactless payments like Apple Pay and Android Pay. You can even upload your company logo so that when in an idle state, your customers will see your logo on the customer-facing screen. 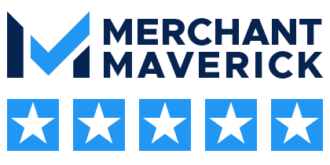 Facing merchants is a 7″ crisp high-definition screen. With an Android operating system and 4-core 1.8Ghz processor, the Poynt smart terminal responds quickly. The touchscreen is 10-finger capacitive multitouch, so you can easily and quickly interact with all applications. Quickly access system menus by swiping down from the top on any active screen. Poynt allows you to easily create multiple different product catalogs with item modifiers and simple drag-and-drop placement. Assign specific product catalogs to a unique Poynt terminal (bar items vs. restaurant items, for example) and assign item modifiers with ease. You can manage your catalogs through devices, or on the Poynt.net cloud-based system. Poynt doesn’t lock you into an expensive accessory ecosystem. Integrate with industry-standard printers, cash drawers, and POS systems. Common accessories include Star and Epson Kitchen Printers, or Star cash drawers. 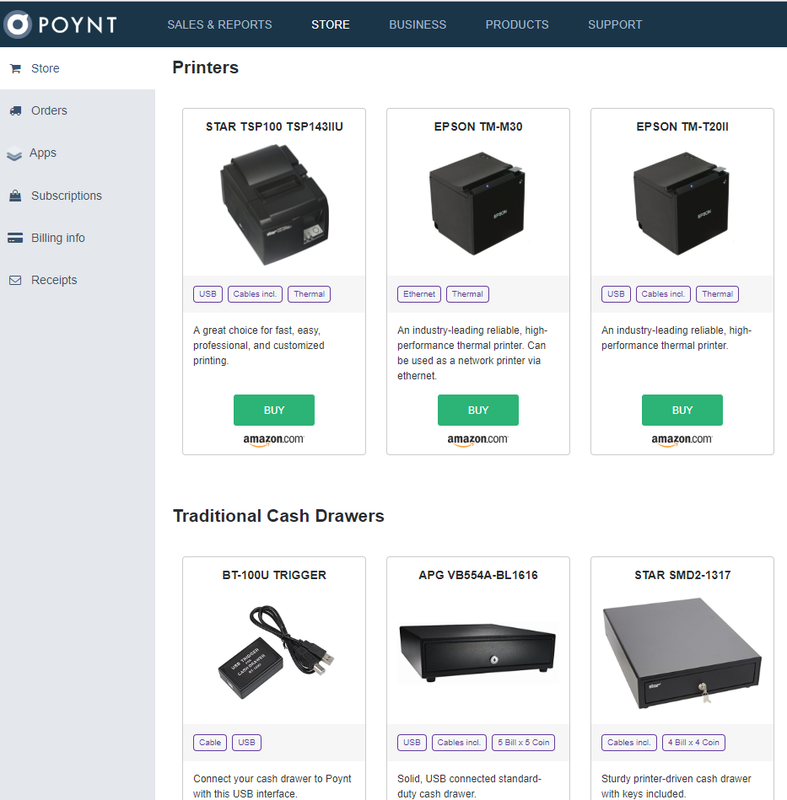 Many restaurant merchants opt to purchase larger printers if they have longer lines, as the internal Poynt printers is smaller than normal credit card terminals. No more waiting for customers to do math, no more collecting receipts, and no more forgetting to adjust for tips at the end of the day. Poynt makes it easy to discreetly ask for tips from your customers in a quick and efficient manner. Offer different tip options, either as a percentage or fixed dollar value. Customers tap a button on their screen, so you can take payments at the table or on the counter. Poynt has two different cameras for easy barcode scanning. The main camera sits below the customer-screen, so that you can quickly scan products for quick order entry. Alternately, you can use the front-facing camera in order to hold a product over the device. 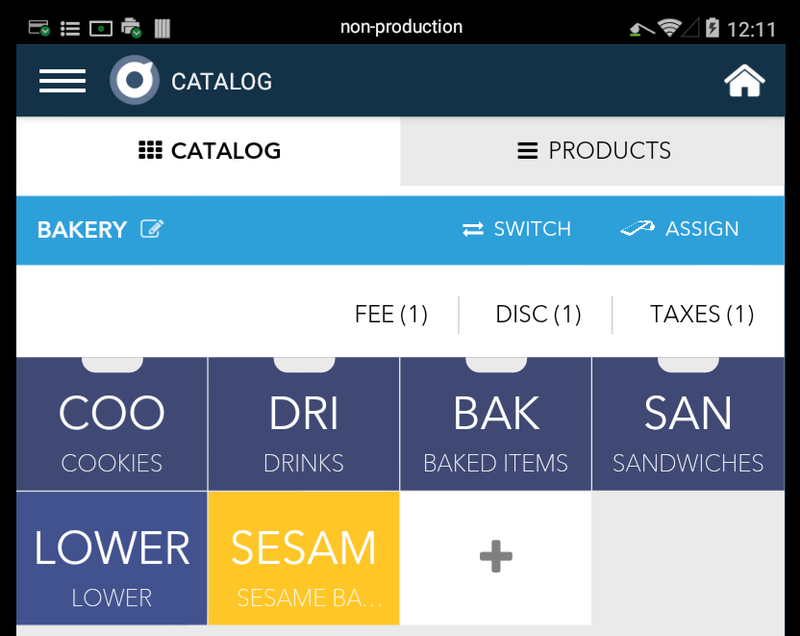 Since Poynt is mobile, you can easily un-dock the device and use it as a barcode scanner for larger, bulkier items. Barcodes link to products in your catalog for easy itemized receipts. Poynt connects to your WiFi or ethernet connection, and has up to 8 hours of battery life. The included charging dock will allow you to easily dock the smart terminal to the base when you’re using the device on the countertop. 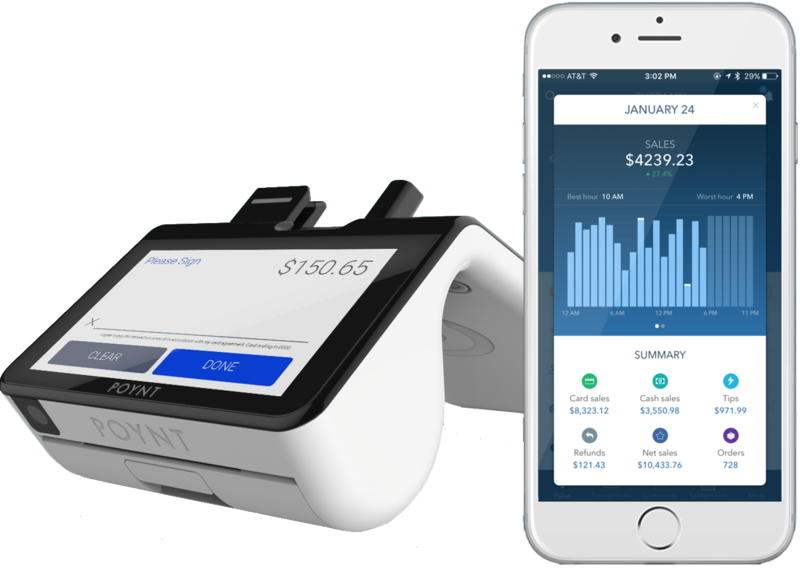 Or, quickly take the Poynt smart terminal to tables at a restaurant, through long lines that are building up, or to customers in your retail area looking at products on shelves. The options are endless.